In its quest to diversify its economy, attract foreign investment and tackle unemployment, the Kingdom of Saudi Arabia (KSA) embarked on developing four new ‘economic cities’ under the principles of smart city planning. The new cities are overseen by the Saudi Arabian General Investment Authority (SAGIA), a governmental agency established in 2000 to act as a gateway to investment in the KSA. Jazan Economic City (JEC) is another one of the four intelligent cities to be developed in the KSA. JEC is located close to Saudi Arabia’s border with Yemen, 60km northwest of Jazan City. It spans an area of 100 km², expected to host a population of 250,000 people. JEC is a state of the art industrial city that is geared to become an important logistics hub, a major destination for regional raw materials and an export platform for global consumer markets. The main economic sectors in JEC are heavy and secondary industries. The industrial products of JEC are expected to be exported to Asia, Africa and Europe; a new seaport and dry dock will be constructed for this purpose. The development cost is approximately $27 billion. Initially, JEC’s developer was the joint venture of Malaysia’s MMC corporation and local Saudi Binlandin Group (SBG) –however, the first has now been removed from the consortium. On the governmental side, the Economic Cities Authority is the prime development facilitator; it acts as the one-stop Government servicing center for the development of JEC. In matters of smart city infrastructure, CISCO will undertake the design and implementation of the network infrastructure and connected city services; the city will be wired with high-speed broadband infrastructure, while all urban operations will be managed through Integrated Operations’ Centers, meant to act as the ‘brain of the city’. Apart from the residential area, the masterplan includes a power plant area, a water desalination plant, an industrial port, an aluminum smelter, a refinery, an iron ore complex and a ship building site. The project started in 2006 and is expected to be complete in 2037. Access the website of Jazan Economic City here. DP Architects (2013). 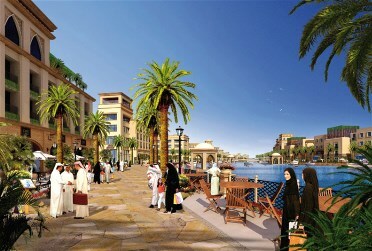 Jazan Economic City Masterplan. Available here.